This salad is what I had for dinner tonight. Only then remembered that this post including the pictures of the salad were sleeping in my computer for more than a month. No time to loose to share this wonderful simple salad recipe with you. 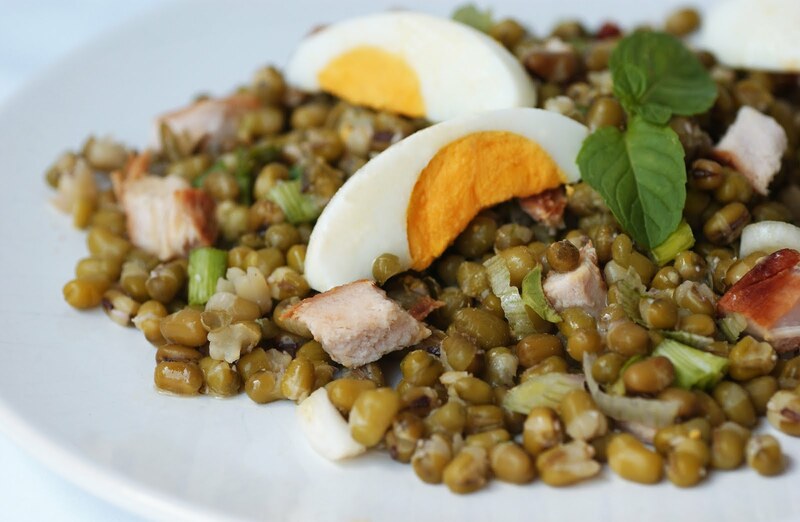 It's a healthy and filling salad, rich in proteins that is easy to prepare (apart from the mung beans that need to be soaked a little, I guess). What I like most about this salad are the boiled eggs. There are an essential part of the salad. Whenever I come across boiled eggs in dishes ( I had them in Indian curry recently), I am surprised how versatile and tasty they actually are. Definitely an enrichment to a meal. Soak the dried mung beans in a large bowl of water for 4-5 hours or overnight. Drain. Bring a large pot of water to a boil. Add mung beans and boil 2 minutes. Remove any foam. Drain beans. Bring another pot of water to the boil, add the beans and cook for another 8-10 minutes. Drain the beans and rinse with cold water. Combine beans, shredded chicken, sliced scallions, chopped mint leaves and salt in a bowl and mix well. Combine the ingredients for the dressing: olive oil, vinegar and mustard and pour over the salad. Toss to coat. Cut each boiled egg lengthwise by four and garnish the salad with the egg slices.